One of most menacing things that spoil your beauty is the formation of pimples on your face and mouth. 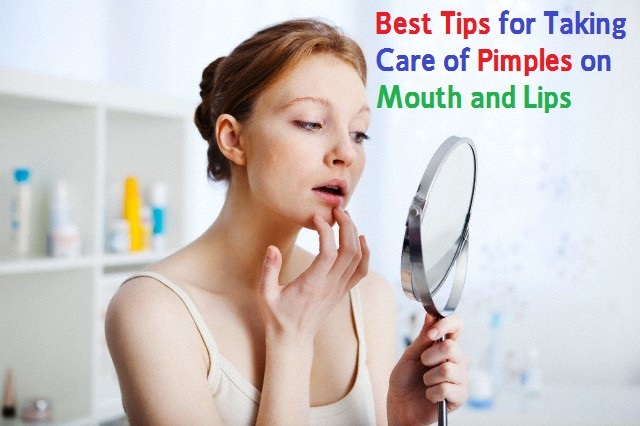 When the pimples are formed on your mouth and lips, it becomes all the more troublesome. They are painful and the pain is enhanced when you unknowingly bite on them. Eating food becomes a torture for you. More energy and time is spent in trying to eat food. When food comes in contact with these pimples, the inflammation increases. Some of the reasons for getting pimples on lips and mouth are excessive releasing of acids, hormone imbalance, deficiency of some vitamins, oily skin, improper diet and so on. Eating unhygienic food also may cause pimples on your lips due to viral infections. You must always wipe your mouth after taking a drink or having food. This is because if food particles are left on your lips and mouth, pimples may form due to formation of bacteria and the oil in the food. Water can greatly help in preventing pimples forming on your mouth and lips. Drink a lot water as it washes away all the toxins from your body and makes you healthy. It also keeps your mouth fresh, without any bad or foul smell, preventing the formation of bacteria in the mouth. Brushing teeth is a common practice and is done twice a day, early in the morning and at night before going to bed. But practically no one take care to brush their lips along with the teeth. You must make it a practice to brush your lips too. You need not give as much pressure on the brush when you brush your lips as you do with your teeth. Just massaging your lips with the brush is enough. It helps in removing dead skin from the lips and also removes impurities and dirt from the lips. You must clean your lips this way twice a day. This is an effective way to prevent pimples appearing on your mouth and lips. Using lip balms is found to be one of the major reasons for causing pimples on your mouth and lips. Often it is because the balm may contain certain chemicals that may be harmful to your skin or allergic to your skin. So if you suffer from pimples on your mouth and lips, stop using the lip balm for a few days and see if you are allergic to the balm. Another reason why lip balms cause pimples is that when you go out after applying the balm, the sticky balm causes the accumulation of dust and dirt on your lips and mouth, which leads to the formation of pimples. Another reason to ward off pimples is to wash your mouth with a medicated mouthwash that has anti-bacterial and anti-fungal properties. Also try to avoid using soaps to wash your face when you have pimples on your lips. Instead of soap, use a good face wash. Many anti-acne products are now available in the market, using which you can prevent pimples on your mouth and lips. Take a clean cloth, dip it in warm water and apply the hot compress on your lips. You may also give a cold compress at intervals to get relief. Before you apply the hot compress on your lips, tie your hair properly so that it does not touch or irritate your lips. This is more effective for blind pimples, which are not as deeply rooted as other pimples. They are formed due to the pores getting blocked and are easy to remove. They are not red and do not contain pus. Cleaning the lips with apple cider vinegar is an effective way to get rid of pimples around your lips and mouth. This is because it contains enzymes and acids that are good for your skin. You must be very patient when you have pimples and must never try to squeeze or break the pimple. These will spread the bacteria all around and make the condition even worse. So always let it heal itself. Just as lip balms may cause pimples on your mouth and lips, face wash may also be the reason for it. Some of the face wash that are available in the market contain strong and harmful chemicals that may damage your skin. Your skin may be allergic to some of the chemicals in the face wash. So change the face wash you are using and try another one. If there is no improvement, you can try other remedies. If after trying a lot of remedies the pimples still persist on your lips and mouth, you must approach a good dermatologist and take his advice. He will give you some antiviral medicines which will reduce the pain heal your pimples fast. Tooth pastes are also responsible for causing pimples. Some of the chemicals in tooth paste may be harmful and cause lesions and pimples around your mouth. So always select a tooth paste that is suitable to you. One of the home remedies for easing the pain caused by pimples in your mouth is to put some sour curd in your mouth and keep it for about 10 to 15 minutes, this helps in healing the pimples fast and also reduces pain. You can also gargle your mouth with salt water to ease the pain. Pimples are not dangerous nor are they incurable. All you need is a bit of patience. You must remember that pimples take some days to get cured and keep up with it. There are many home remedies to get rid of it and if they are persistent, you may consult a doctor. So when you have a pimple on your mouth or lips next time, try some of the remedies mentioned above. You will be amazed at the result you get.